The artist Seurat showed us how a simple dot can create great art! 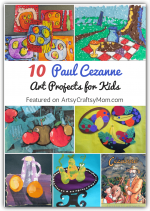 Introduce kids to the science of color with these Georges Seurat art projects for kids. For many people, things like art and music are one area of study that is diametrically opposite to an area that includes math and science. For them, science and mathematics help us understand everything in the universe, while art and music are secondary, merely forms of entertainment. However, one meeting with French artist Georges Seurat, and these people will be eating their words! To understand this, let’s take a look at one of Seurat’s most iconic paintings, ‘ A Sunday Afternoon on the Island of La Grande Jatte‘. What do you notice about the painting above? You can see that the colors have a softer feel, and though the overall work looks clean and neatly outlined, there is a lot of depth in terms of color and shade. This is because of Seurat’s favorite painting technique – pointillism. In pointillism, tiny dots of color are put together on canvas, repeatedly, till it fills in an entire area. So rather than the painter mixing up these dots of paint, your brain mixes it up so your eyes see it as a single picture rather than a combination of dots. You could say that the painting has an almost ‘digital’ feel to it! All this sounds quite scientific, and that’s because it is! Seurat went through scientists’ writings on color theory, and how the human eye views colors. After lots of study, he realized that one could use colors by understanding them scientifically, and this led to the creation of a new language called Chromoluminarism. Science! Since Georges Seurat’s birthday is coming up on 2nd December, we think this is a great time to introduce kids to this amazing artist who created so many outstanding paintings during his short but eventful life. 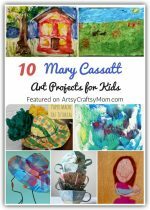 These Georges Seurat art projects for kids are perfect for the purpose and also help kids learn a lot about the science of color! Georges Seurat was a French artist and his mother was a Parisienne, so it’s obvious that he would paint the Eiffel Tower! And of course, he did it in his trademark style! Me and the Chicks have a cute remake of this painting, using Q Tips to create the dots. 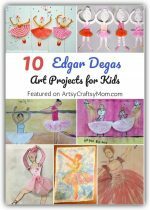 The Crafting Chicks has a simple project to introduce kids to pointillism, using printable coloring pages. This is a great open ended activity where you can use art materials of your choice – markers, paints, Q-tips. Kids can see how different materials create different kinds of dots. Making art with dots is fun, but making it 3 D is even better! Crayola shows us how to channel Seurat with modelling clay, by making tiny dots and then fixing it to create a complete picture. Be sure to get the outlines down first, so you’re not wondering what to put where! 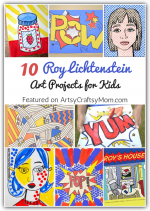 You’re never too young to learn about art, as this project from Moms Town proves! This is a simple fingerprint pointillism project for preschoolers. With a ready made tree trunk and colored paints laid out, this should be simple enough for them to do. This is a cute little book that’s also available as a board book. 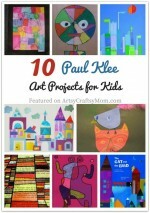 It introduces kids to Seurat’s painting using simple, rhyming prose and of course, impressive illustrations! The pages feature closeups of the grand painting, which’ll help kids understand how detailed it really is. Most of the time the erasers at the end of pencils aren’t very effective at erasing anything, but they aren’t entirely useless – they’re perfect for pointillism! The Crafty Classroom shows us how to use new pencil erasers to create Seurat-inspired art that’s quite good looking! If you thought Q tips or pencil erasers were all you could use to create Seurat-inspired art, think again! Pieces by Polly uses crayons and heat to create some amazing pointillism art, that’s totally frame-worthy! We love the colors used here and the way they’re mixed. Don’t throw out all those colorful plastic bottle caps – we need them! Check out Art Masterpiece Corner, where they upcycle bottle lids of different colors to create a one-of-a-kind Seurat-inspired art piece! This is absolutely genius and great for kids of all ages! There really is no dearth of ideas when you want to create dots! Laly Mom uses a paper punch and paint swatches to get little dots, which can then be arranged to create practically anything you like. For beginners, use large sized punches, and go for a simple picture like the apple featured in the post. Seurat’s ‘Le Grande Jatte’ masterpiece is a huge painting, and took him over 60 study sketches and 2 years to complete. Kids can create their own version in a fraction of a time, by collaborating with each other. Lego Librarian has a 15 sheet printable of the painting, so each child can fill it in and then you can put it together for a unique, custom Seurat-inspired artwork! It’s amazing what a little dot can do, right? 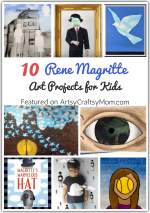 These Georges Seurat art projects for kids should help them understand the concept of little things coming together to create something larger and more beautiful. The best part about these projects is that you can make them as simple or complex as you like. Older kids can use more colors to create depth and shadows, while little ones can play around with finger paints. You can print out any simple shape and let the kids practice on it. Try different materials like pom poms, Q tips, brushes and erasers, as well as stickers, paper punches or buttons to create art. As they say, the sky’s the limit!